I remember the time when I decided to take a vacation in Florence with one of my friends. Before travelling, we didn’t expect that we would be so amazed by this city, which is the starting point of the Via Francigena di Francesco or Saint Francis Way. There were so many things to see and so many things to do that everyday was a new opportunity to discover more and more the Italian culture. What did I enjoy the most, you must wonder? Well it was the whole combination of Italian people, the food, the stunning monuments, the entire way of life basically. Our first day in Italy and in Florence particularly, we just had to try the best known of all Italian foods: pasta. We went to a restaurant in Borgo San Lorenzo street at the corner with Piazza del Duomo, the magnificent Florence Cathedral, superbly located in the heart of Florence. Once we were at the table and the waiter brought the menu we were surprised to see pasta was simply a starter (primo in Italian) instead of a main course. As we were curious and we wanted to know more about the Italian culture we went for the whole Florentina meal. Why whole? Because a traditional Florentina Meal is composed by two courses plus an appetizer and a dessert. You start with antipasto (appetizer), which is usually an assorted plate of salami and round toast topped with dips. Then your first course (primo in italian) is basically a soup or pasta dishes such as spaghetti alla carrettiera (with spicy tomato sauce), one of the most popular pasta dishes in Florence. You might be probably full by now but you are only half-way throught the meal, the next dish is the main course (secondo in Italian), where you could finally fancy a bit of meat. The famous secondo dish is usually bistecca florentina, a huge steak grilled and brushed with olive oil and pepper, simply yummy! Then the icing on the cake: dessert. A traditional tiramisú cake soaked in espresso coffee with creamy mascarpone cheese and dusted with cocoa. The best thing to do after this huge but delicious meal is to go for a long walk through the streets of Florence and discover the famous landmarks of this city, considered as the city of the Renaissance age. 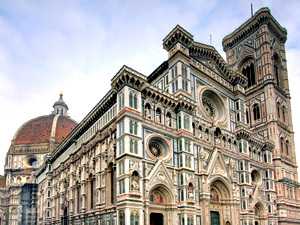 I remember, during my time in Florence, being constantly amazed by the architecture. 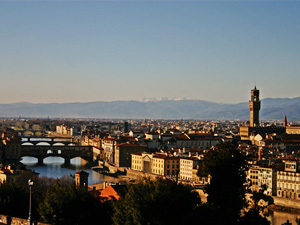 Along my walk I could definitely feel the glorious past of Florence,centre of the medieval European trade and finance. The finest example must be Ponte Vecchio, the bridge where the most prestigious gold and silver jewellery is still being sold. It is also unique for being the first bridge in Europe to have houses built over it. You have an incredible view over the Arno River. Although the best scenery that we have seen while we were in Florence was after climbing up probably 100 or 200 steps to reach the Piazzale Michelangelo. It was tough but totally worth it. This lookout point offered us magnificent views over the most famous monuments of the city with the Tuscan hills providing a scenic backdrop. After being amazed by the whole city, we also enjoyed spending some time window shopping in the most popular and luxurious clothing stores such as Gucci or Ferragamo (these two design houses being native to Florence), in the area of Via Tornabuoni, Via della Vigna Nuova, and Via dei Calzaiuoli. Even if we were not such big fans of Haute Couture we couldn’t deny and appreciate good Italian design. However as we were in Florence and we knew the reputation about its leather we wanted to come back with a leather good souvenir. And for that the best place to find it was San Lorenzo Market. This market was based from the Church of San Lorenzo along Via Ariento all the way to Via Nazionale. There are so many stalls we had almost too many options but we found what we were looking for. Florence is the starting point of the Via Francigena di Francesco, the Saint Francis Way or Saint Francis Camino. You should definitely take some time to explore this amazing city before you start your Saint Francis walk. It was where, to me, I experienced the best Italian culture and I will recommend it to everyone to stop by. Ask our travel consultants for additional nights and hotel upgrades in the main towns and cities. To book your Via Francigena di Francesco, Camino to Rome holiday and for more training tips contact our travel specialists.